This year our school is talking about student work in mixed groups. We have been placed into 7 groups of teachers and social workers, each of whom are related to one student. After each session, the teacher bringing the work gets ideas for their teaching, and the group gains insights into the student and how our work affects them. These conversations have only involved essays so far, but this past Friday I was the presenter. Due to realities of our schedule I provided a student’s partially finished math project for our descriptive inquiry group to look through. It was a project where the student had to create a set of equations that then help her solve a larger problem. The student make a mistake early on in the assignment and continued finishing the work, not being able to see that answers stopped making any sense. The discussion about this did not just allow for us to talk about the student. It allowed the members of the group a chance to step into a math teachers shoes and decide to how to respond to student misconception. Talking about this student’s work flared up and we ended up having to scrap the rest of the inquiry protocol. The issue that broke our group apart happened after I explained the project and everyone gave their initial impressions. Someone noticed that the student made the a mistake. “The student should have multiplied these answers by x,” the teacher stated, referring to the column with numbers far to small to make sense in the situation, “so the teacher should show them what correct answer should be.” I began to feel a little uncomfortable. My instincts say the first thing to do would be to understand why the student made the mistake. I would need to ask a series of questions before I gave any kind of instruction. Thesequestions would intend to help the student to understand why the need to correct it, not to correct the multiplication, thus preventing the student from making sense of the problem. A second teacher also noticed that the student made an error, and said that the solution is that the teacher should tell the student that they made a mistake and they should fix it. It was here that I looked around and realized that I was the only math teacher in the group. It seemed like it might be good for me as a presenter to briefly explain why a viewpoint of the teacher as the source of all knowledge is not my philosophy. It wasn’t supposed to be long, but it certainly felt long when I stopped talking, and a little rant-y. Perhaps I should have just waited until later in the protocol instead jumping in during the the first (first!) round of initial impressions. Perhaps. But, I think as presenter the group needed to know that I value students developing agency and being indendpent learners than I do getting back a stack of “answers” quick and easy at the end of each period. I also may be more passionate about it than I realize. Either way, members of the group were now on the defensive, and the protocol was broken. Before we could move past the initial impressions a colleague suggested another way the student could be helped. This way centered around me showing the student how to work step-by-step to correct their mistake. “This is a end-of-cycle project. The student has worked on problems these kinds of problems for weeks, the next step is to make sense of the problem so they can understand.” I said, channeling my inner Samuel Jackson. My statements ended by saying “Oh, so that’s what life is going to do??? Sit down and give her the answer?? ?” Well, maybe it wasn’t a full Pulp Fiction rant, but it wasn’t good. My breaking the protocol has now led to a heated back and forth with me and another staff member about what help should look like. My co-worker had a real point about how to help students get success. Some students expect math to be merely about correctly performing calculations and getting the right answer. I want the student to look at the work and think about how it makes sense in the problem. To my coworker, it sounds like I’m showing the student something she obviously doesn’t understand and saying “Figure it out” while refusing to offer their kind of help. At this point we are having a full on conversation about the kinds of help that should be offered in math class and the protocol is out the window. After having time to think about it, I think our school needs help getting my idea of what help should look like. Honestly, why would staff think that math should be anything other than what they experienced in school? We are going to meet as a group this week, and maybe I’ll shut my big mouth and the work will speak for itself. As far as the student goes, I wonder what kind of work skills need to be taught during the year so that the kids can be independently successful. It doesn’t work to wait until the final project to give kids a chance to experience the importance of making sense of the problem, checking your work, and productive struggle. If I have taught them through the cycle that the problems we are doing are so small that you won’t need help then I will only break their hearts at the end, where they need help most. If we want the project to be a completely novel situation, many kids are expecting to be saved by the teacher, or their classmate, or the bell, or maybe one of the teachers in this inquiry group. 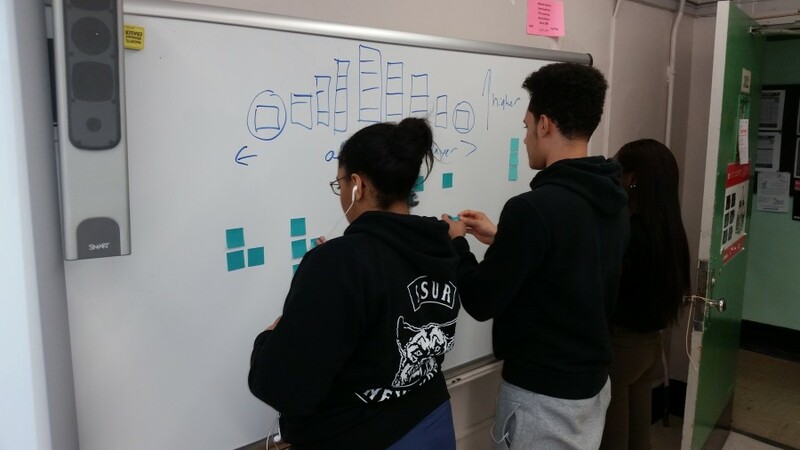 If I want students to really have success in the kind of math class I envision, I need to make it a priority to teach the skills students need to be truly independent and communicate that with the rest of the staff.